Why not take an extra step and allow the customers to conveniently go shopping at your store with the coupon code already filled in? The Coupon Link Builder was developed to address such needs. From it, you can get a URL that the customers can just click on to go back to your site with the code is already applied in advance. Where is the Coupon Link Builder? 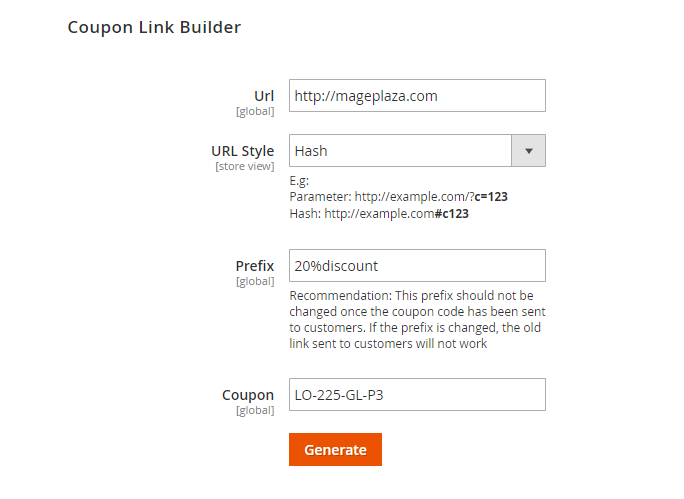 From your backend, look at the admin panel and go to Stores > Configuration > Mageplaza > Better Coupon. You would find the Builder under there. In the third field we got “Prefix”. This small text will be added to the URL and it’s a good place to insert some information about the link, making it more user friendly. For example, you can add “20%discount” so the customers can know how much they get off with just a glance. At the bottom is the “Coupon” field where you put in the coupon code you created from the Generator. Finally, click Generate and voila! the link is created below. With the URL in your hand, you can send it to customer who now can easily go shopping at your store without worrying about the code. Coupon is a great motivation tool, but the actual process of discounting must be facilitated in every possible way for it to be truly effective. This feature is really handy for the users and is a nice way to show how much thought you give to creating the best customer experience.